At around 2am on 26th August 2013, eleven military jeeps invaded Qalandiya refugee camp during an operation to arrest a recently released prisoner. Residents of the camp tried to stop the army from arresting the man by throwing stones at military jeeps. Confrontations then erupted, with the Israeli soldiers shooting tear-gas canisters, rubber-coated steel bullets and live ammunition at the youth defending the refugee camp. Nineteen people were injured from live ammunition and rubber-coated steel bullets and two were killed on the spot, with a third dying shortly afterwards. Around six of these are still reportedly in a critical condition. 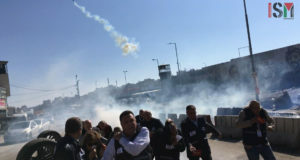 Demonstrations mourning the martyrs and out of anger at their deaths spread across the West Bank, with particularly fierce clashes at Qalandiya checkpoint and in the city of Hebron. During the early morning raid, 32-year-old Robin Ziad, a UN Relief and Works Agency (UNRWA) worker, was on his way to work when he was shot in the chest with live ammunition. Younes Jahjouh, aged 22, was shot in the chest; while 20-year-old Jihad Aslan was shot in the neck – also with live ammunition. Robin and Younes died immediately from their wounds, whereas Jihad was transferred to Ramallah hospital, where he was declared clinically dead later in the morning. Israeli forces continued their raid, arresting the man they were looking for and leaving the refugee camp at around 7.30am. 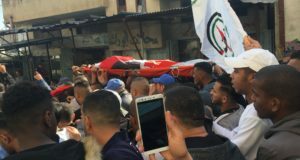 Hundreds of mourners attended the funeral of the three martyrs at Qalandiya refugee camp, as friends and family members carried their bodies through the camp to the cemetery where they were buried. Gunshots and chants protesting their killing were heard throughout the ceremony as mourners filled the streets surrounding the cemetery. 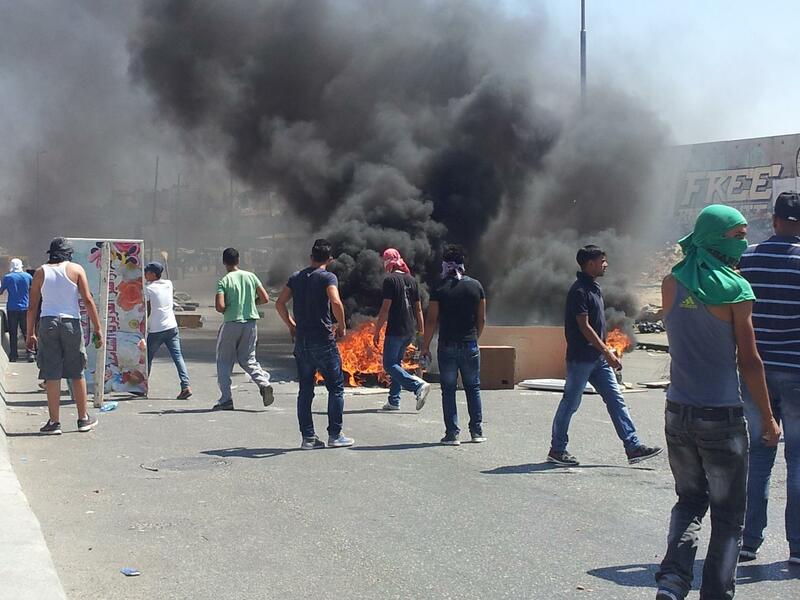 After the funeral, dozens of youths marched along the main road to Qalandiya checkpoint and made barricades of burning tyres to prevent the Israeli military from approaching. 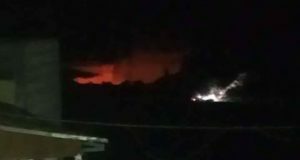 Israeli forces arrived from across the checkpoint and shot several rounds of tear-gas canisters and sound bombs, while Palestinian youth defended the area by throwing stones at the Apartheid Wall, the checkpoint and the heavily armed and armoured soldiers. As confrontations continued, Israeli forces shot many rounds of rubber-coated steel bullets at protesters, injuring at least ten. Medical personnel present at the scene also treated an old man who had suffered from the effects of excessive teargas inhalation. Across the West Bank, there was a general strike as shops and businesses shut down for the day in solidarity with the martyrs and in protest against the occupation that caused it. Also, as news spread of the three martyrs, solidarity demonstrations sparked in many other cities and refugee camps. Hundreds of protesters took to the streets of Hebron in response to the killings. Demonstrators armed with stones were met with teargas canisters, rubber coated steel bullets and sound bombs from the Israeli army. 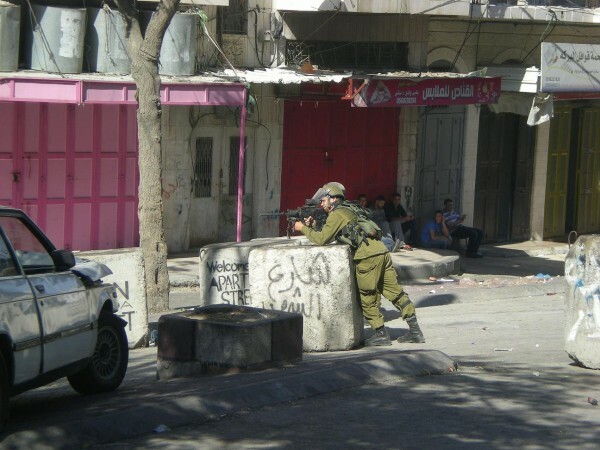 The clashes continued for around eight hours and shut down the main shopping streets of Hebron, where barricades were constructed from burning tyres and empty water tanks. 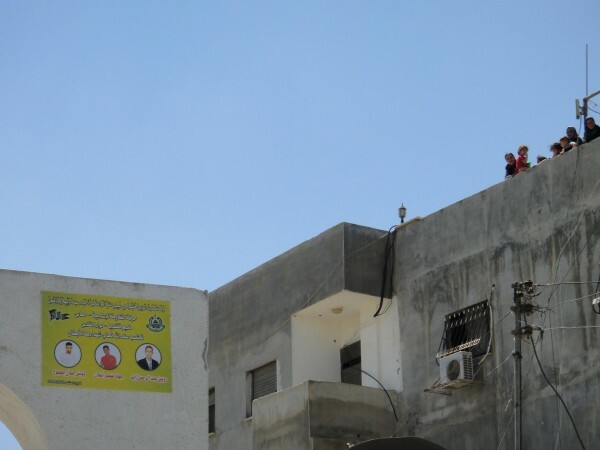 Israeli soldiers invaded the Palestinian Authority controlled H1 area, taking up positions on the roofs of residential buildings. The Israeli forces arrested at least four Palestinians, including Amjad Ibrahim Al-Natcha, 19, and three children. Confrontations between Israeli forces and Palestinian youth protesting the killings also happened at Al Fawwar refugee camp near Hebron, Aida refugee camp near Bethlehem and Al Ram, amongst others. Tomorrow, 27th August, has been declared the “Day of Anger” and more protests throughout the West Bank in response to the Qalandiya killings and the continued occupation are expected.